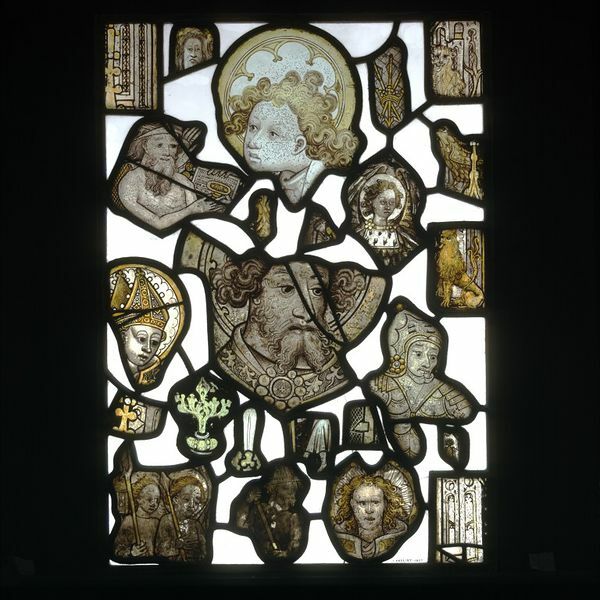 The panel depicted here is composed of stained glass fragments that are English and date between the 14th and 15th centuries. The fragment showing an angel's head at the top of the panel was given to the Victoria & Albert Museum and the donor said it came from York Minster. This has not been substantiated but it is quite possible. These different fragments of decorated glass have been displayed in these 'composite' panels to illustrate techniques in Medieval window glass decoration. England had a rich tradition of stained glass in the Middle Ages but much of it was destroyed by official government action or by iconoclastic fervour in the Reformation and Puritan periods. In the 18th century there was a new interest in medieval stained glass and by the following century much old glass was being imported from abroad or uncovered in excavations or from old storage locations in this country. Sadly, much of the old English stained glass only survives in a fragmentary state. The fragment featured here depicts the head of an angel or a saint. It illustrates a technique of decorating glass that developed in the early part of the 14th century. It consisted of painting a compound of silver on the back of the glass which, after firing in a kiln, turned yellow and penetrated, stained, the upper layers of the glass. Many panels from that period until 1500 are decorated simply in yellow (silver) stain and highlighted with a brown/black pigment, as shown here. Thre are other saints and angels depicted in this panel as well as the head and shoulders of a man in armour. Given from Signora Ada Cardinale as part of a group of ceramics. Note in Register: Mrs. Cardinale stated that this piece of glass was given to her by her mother and that it was supposed to have come from York Minster. 4473/1927: No other glass mentioned in file. Ada Cardinale donated a lot of ceramics. Stained glass fragment depicting the head of a young saint or angel with a cusped nimbus. Clean-shaven face looking to his right (our left), wearing an amice, English, mid 15th century. Framed with part of C.480-1927 and other fragments, all English, 14th to 15th centuries.